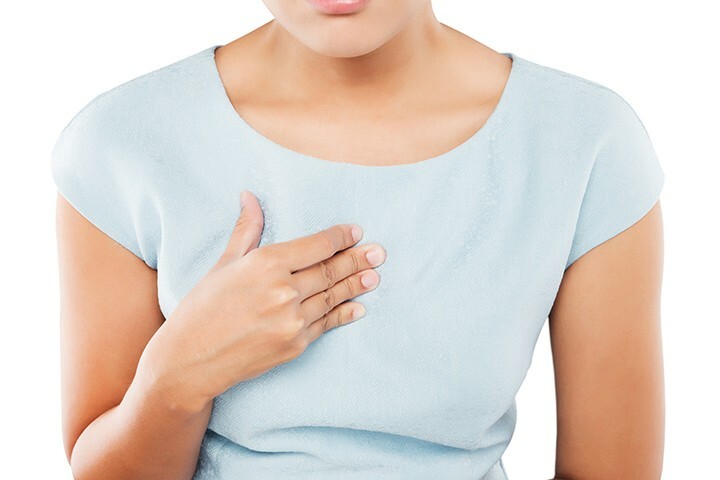 What is heartburn and what are some common causes? Heartburn is described as a burning sensation that can be painful in the lower chest area. It affects more than 60% of Americans at some time or the other. If you have had its likely unpleasant. Many people want to know the link between heartburn and probiotics, for instance can probiotics help heartburn or is it the opposite. Do probiotics cause heartburn? Heartburn may or may not be accompanied with a bitter sensation in your mouth. It could get triggered after a large meal and can usually be treated with home remedies. Here is everything you need to know about heartburn and its common causes. Heartburn is a symptom of acid reflux. The mouth is connected to the stomach with a tube called esophagus. There is a special area of circular muscles called the lower esophageal sphincter (LES) located right at the junction of the stomach and esophagus. These muscles prevent stomach content from escaping back into the esophagus. They open only when you belch or swallow. However, people suffering from acid reflux have weak LES muscles. The stomach has a protective cell lining to prevent inflammation from acids and digestive juices. However, the esophagus has no such lining. There are many food stuffs that relax the LES muscles. There are also certain triggers of heartburn that are linked to your lifestyle. These are the most common causes. There are two ways that high fat foods cause heartburn. First, they relax the LES muscles causing stomach acid to escape into the esophagus and cause heartburn. Secondly, they stimulate the release of a hormone called hormone cholecystokinin (CCK) which again helps in relaxing the LES muscles. CCK has a primary function of encouraging food to stay longer in the digestive system promoting better digestion. Unfortunately, it also increases the risk of acid reflux. High fat foods include both unhealthy and healthy options such as fried foods, avocado, cheese, and nuts. Drinking citrus juices such as orange juice may trigger heartburn. In a research study, 67% people showed symptoms of heartburn after drinking orange juice. The study also showed that 75% of the subjects suffered heartburn after drinking grapefruit juice. This suggests that high volumes of citric acid have a direct impact on heartburn. However, studies have not been able to prove a direct correlation between citric juices and heartburn. Chocolate works the same way as high fat foods in the digestive system. It helps relax the LES muscles which allows stomach acid to escape into the esophagus tube. The ‘happy’hormone Serotonin in chocolate also relaxes the LES muscles. Compounds caffeine and theobromine present in chocolate also relaxes LES. A major component of spicy food is a compound called capsaicin which slows down digestion, a known heartbun cause. A serious risk factor for heartburn is food sitting in your stomach. Spicy food may also irritate an already inflamed esophagus and LES. This can increase the risk of heartburn. Certain exercises such as sit-ups and crunches can cause heartburns. Bending exercises increase pressure on abdomen which thrust stomach acids back into the esophagus. Leg lifts is also a common cause of heartburn. Yoga positions such as headstands or downward dog can reverse the natural flow of food through the esophagus tube. This is one of the reasons why yoga is recommended on an empty stomach. A weak LES might not be able to keep the food down during jarring exercises such as running or jogging. Fitness experts recommend waiting for at least two hours before exercising. This helps food to settle in your stomach and prevents heartburn and acid reflux. Medications can either trigger heartburn or make it worse. Regular use of nonsteroidal anti-inflammatory drugs can irritate the esophagus. Aspirins, ibuprofen, and nanproxen are common drugs that cause heartburn. Several blood pressure medicines including nitrates and calcium channel blockers also cause stomach acid to retreat backwards. Various lifestyle habits such as consuming large quantities of alcohol or being a smoker increases the risk of heartburn. Smoking abnormally relaxes and opens the LES causing stomach acid to travel upwards. It also stimulates acid production in the stomach. Alcohol slows down the emptying of stomach. Foods and fluids sitting in the stomach may increase the risk of heartburn. heartburn causes acid buildup which can escape into the esophagus. On the other hand prolonged hunger leads to over eating or eating large meals. This is again a heartburn trigger. Obese people are more at risk of heartburn as they have constant pressure on their stomach. This can cause stomach contents to be pushed back into the esophagus. Stress causes mild acid reflux. However, you might feel it more in a troubled state of mind. You tend to become more aware of your physical woes when mentally troubled. You can prevent heartburn in such circumstances by practicing relaxation techniques and getting regular exercise. Heartburn can seriously impact your lifestyle by interrupting sleep, limiting food options and interfering with daily activities. However, by keeping tabs on your eating habits, you can identify the potential causes and prevent triggers. Maintain a diary that lists out everything you eat and portion sizes. You must include everything you drink as well with time and date. Make a note of any abdominal or heart pain in this diary. Describe the pain, its duration and what made you feel better. Write your exercise schedule including time and type. Mention clearly if you feel any pain before or after a workout linked to your digestive system. After about two weeks you should be able to identify common triggers. Make a game plan to avoid these triggers. Occasional episodes of heartburn can be treated at home with over-the-counter medications or holistic food options such as ginger, melons, or a glass of cold milk. However, if you have no previous incidence of acid indigestion and if heartburn erupts suddenly, you should visit a doctor to rule other potentially serious conditions. You should also visit a doctor when your heartburn episodes are frequent even after you take medications to treat the symptoms. Heartburn can be painful and persistent if the symptoms are ignored. It is best to identify the triggers and create a health strategy to avoid them. Visit a doctor if the symptoms do not go away even with medication/s.